What is centipede? What is it used for? The centipede is a long, flattened insect found worldwide. There are approximately 2,800 species of centipede known to exist; in China, they are produced predominantly in the Jiangsu, Zhejiang, Hubei, Hunan, Shaanxi and Anhui provinces. The typical centipede is between four and eight inches long and less than half an inch wide, ranges in color from yellow to red to brown, and is divided into 22 segments, with a pair of antennae and a pair of jaw-like hooks on the head. Centipedes usually have an unpleasant odor, and are somewhat salty in taste. They are usually boiled, dried in the sun, then smashed into a powder for use in herbal preparations. In traditional Chinese medicine, centipede is associated with the Liver meridian, and has pungent, warm and slightly toxic properties. Its functions are to clear wind and spasm, and to dissipate toxins and nodules. Centipede is used to treat conditions such as lockjaw, seizures and convulsions. It is also employed to relieve sores and carbuncles on the skin, and alleviate pain, especially headaches. Occasionally, centipede can be applied topically. Centipede is often used with herbs and substances such as gastrodia, silkworm and uncaria. How much centipede should I take? The typical dose of centipede is between 0.6 grams and 1 gram, taken three times per day. It is usually powdered and taken as a decoction. What forms of centipede are available? Centipede is usually available as a powder. It is extremely expensive. What can happen if I take too much centipede? Are there any interactions I should be aware of? What precautions should I take? 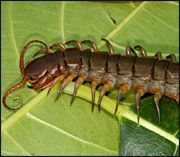 Centipede is considered toxic; a bite from a live centipede can cause swelling and may even require medical attention. As such, it should be used only with extreme caution, and should never be taken by women who are pregnant or breastfeeding. As always, make sure to consult with a licensed health care provider before taking centipede or any other herbal remedy or dietary supplement. Centipede (wu gong). Available online. Chen JK. Acupuncture and herbs in the treatment of neurodegenerative disorders: Alzheimer's disease, stroke, and Parkinson's disease. Medical Acupuncture, Spring/Summer 1999;11(1). Yeung HC. Handbook of Chinese Herbs, revised edition. Brookline, Mass: Redwing Book Co., 1983.